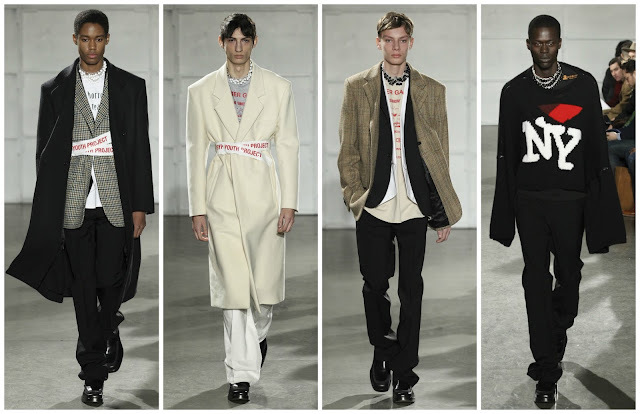 New York Fashion Week: Men’s hasn’t gained the same traction as London Fashion Week Men’s. Borne out of necessity for the mounting menswear market, LFWM emerged years ago and is now the breeding ground for the brightest talents menswear has seen in years: J.W. 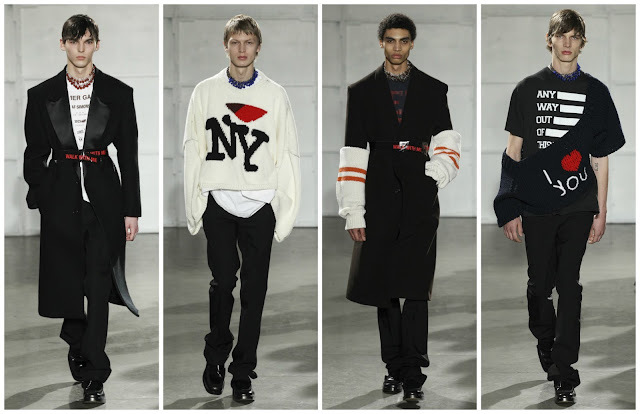 Anderson, Craig Green, Christopher Shannon to newcomers Kiko Kostadinov, Charles Jeffrey. NYFW:M has achieved similar success for many reasons. Chiefly, New York fashion is founded on the principle of functionality and commerciality whereas London prioritises thought, without compromising the saleability of garments. When it was announced in October that Raf Simons—newly appointed chief creative officer at Calvin Klein—would be moving his eponymous label to America to a facilitate his new position there was a collective utterance of happiness. Raf Simons would be invigorating a flat fashion week. Not only would the fashion press benefit from an inspired instalment to the week but the event itself, lacking prestige would be able to prosper. It is an interesting time to be showing in America, with the recent inauguration of Donald J Trump as the 45th President. Along with his inauguration have come a barrage of controversial executive orders that contradict the foundations on which America stand. It was very much expected of Raf to comment on the times and so he did. Backstage, he said, “you have to bring things that stand against it. I think we all have to activate.” There was nothing pointedly political, although there was a lot to politicise. The first thing that struck one about the collection was the repositioning of Milton Glaser’s iconic ‘I ❤ New York’ logo. The image was distorted on a wool sweater and half the love heart disappeared. ‘Any Way Out Of This Nightmare’ was written on a t-shirt and it echoed the thoughts of so many who have to endure Trumpism on a daily basis, and galvanise while also trying not to become depressed with the horrifying news that emerges daily. Elsewhere, Raf referenced the American Psycho way of dressing that underscored 90s fashion, particularly in New York. (It wouldn’t be a collection from the Belgian designer if it wasn’t touched by horror.) Christian Bale’s investment banker antihero, suavely clad in the finest suits was picked up by Martine Rose in London this season. Raf too wanted to explore the male-centric world of Wall Street. Trench coats—some in satin—and traditional work trousers dominated the collection. Where Raf sought innovation was with the styling and silhouette. Masculine shapes were repositioned to something closely aligned with womenswear: the cinched waist. Men’s dressing is centred around the hips as the defining area but here it was the midriff area; it was fetishistically styled with masking tape, some writ with ‘Youth Project’. Americana and youth culture are interwoven with his collections. In the past he has referenced American filmmakers and artists, David Lynch, Cindy Sherman, Wes Craven. For Fall 2016 he drew upon varsity jackets and sweaters, channelling them into hauntingly oversized, ravaged garments. American youth sportswear reappeared here in the form of striped arm-warmers. Youth culture was visible in the way the models had their shirts untucked nonchalantly, their social discomfort tangible, the way their sleeves stretched beyond their fingertips. He captures the spirit of the aspirations of America’s youth culture. Raf Simons may be the best thing to happen to American fashion. You’ve likely read the headlines: Make American Fashion Great Again. In its current dormant state, Raf’s arrival will hopefully signify a volcanic burst in the designers. They either step up to the challenge of upping the ante or else they’ll drown in their own mediocrity, to put it harshly. There is no room for complacency now that Raf is in town. The spotlight is on America, the spotlight is on American fashion. It always has been for Raf though.